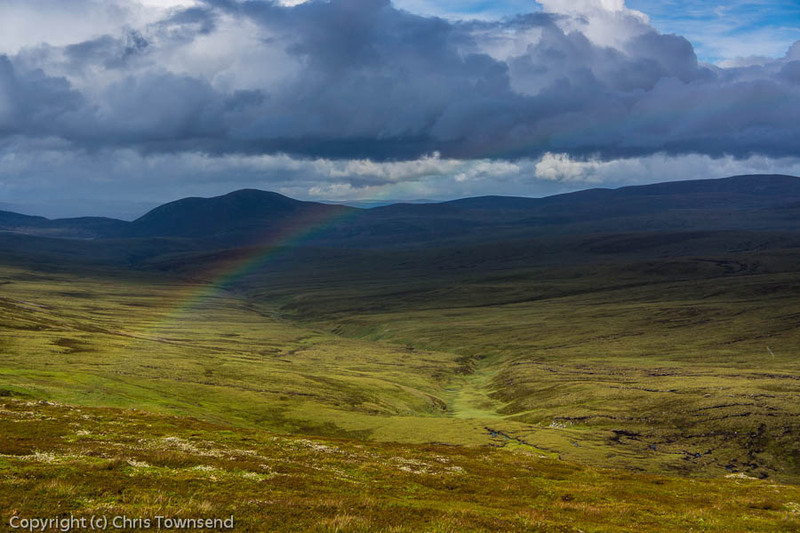 Chris Townsend Outdoors: Good News for Scottish Wild Land? Will areas like Allt Duine in the Monadh Liath hills now be protected? For the first time Scottish Planning Policy will include references to maps of Scotland’s wild land – drawn up by Scottish Natural Heritage. In relation to wind farms, proposals also include strengthening environmental protection in the 31 per cent of Scotland covered by our wildest and most scenic land, including no wind farms in the 19 per cent of Scotland covered by National Parks and National Scenic Areas. The Scottish Government has proposed that our work to map areas of wild land (that will in time replace the 2002 map of search areas), be used to identify 'core areas of wild land character' which need to be given significant protection from wind farm development under Scottish Planning Policy. The combination of National Scenic Areas and core areas of wild land, which overlap but are not exactly the same, should mean that most of Scotland’s magnificent landscape is protected from wind farms (and, hopefully, any other destructive developments). It is interesting to compare the two maps – wild land and NSAs. If all the land covered by them is protected it will be wonderful. I think the Scottish Government is to be congratulated for listening to those of us who have called for such protection and for realising the importance and value of wild land. The new planning policy won’t be finalised until the end of the year. I hope that no new wind farms in wild land will be permitted before then. The proposals are now open for consultation and I expect that many people and organisations will want to comment. Unsurprisingly many conservation, environmental and renewable energy groups have already reacted online – and far more will I expect. Amongst those who have responded are Cameron McNeish, who has been directly involved in discussions with Scottish ministers, with an excellent piece in his Walk Highlands column, along with RSPB Scotland (who welcome the proposals though with some reservations) and ScottishRenewables (who aren’t happy). This is probably really sad news for the rest of us then. We are well above sautration point here in Dumfries and Galloway with new projects comming forward almost on a weekly basis. Cumulative impact went by the board ages ago! I take it some pundits would say we have no real wild land down here then! Makes me sick really! There is an area of wild land marked in Dumfries and Galloway. Of course wind farms that already have planning permission will still go ahead. I assume none are in the wild land area or it wouldn't have been included. Looking at the map I don't see any Chris. The Lowthers, Carsphairn Hills and the two Galloway ridgelines don't seem to be included. Then there is all the braw land at lesser heights like around here at Moniaive. You would be better looking at a windfarm map for what actually is being proposed for down here. It is heartbraking. Sorry for all the typos in the other comment. Dead beat at present and as you can see very disjaiket! On the wild land map area 1 is in Dumfriess and Galloway. Areas 2 and 3 might be as well. I need to see a more detailed map. Cameron McNeish, who I think has seen such a map, says protected ares are Upper Tweedale, Eildon and Leaderfoot, the Nith Estuary, the East Stewartry Coast and the Fleet Valley. Cameron is listing the National Scenic Areas which would get the full protection under the draft planning guidance I think. This is an old designation which maybe hasn't been given so much weight until now. The areas were based on WH Murray's Highland Survey commissioned by NTS back in the early 60s. Its a great list. The wild land map is a separate thing, these areas get some protection but not blanket - I think a presumption against wind farms. This is in addition to the blanket protection for the National Scenic Areas and National Parks. Really would like to make a combined map showing all three of these types of areas but I suspect copyright issues. May try to put something together if I can. Thanks Paul. My mistake. Cameron is listing the NSAs not the wild land areas. I think how much protection the NSAs and wild land areas each end up with depends on the final planning policy after consultation. It could change from the proposals. It's better than nothing. What really needs to happen is to have an exclusion zone as well around these National Scenic Areas. I'd suggest around 75 miles (that's around the distance I could see from the summit of Cairn Gormon on the beautiful crisp winter's day I had in mid-January 2012) and remove any windfarm already in the zone. Somehow I don't think that's going to happen. David, an exclusion zone would be ideal but I suspect you're right it won't happen. I certainly don't think any wind farms are going to be removed. This plan to protect all NSAs and the wild land areas on the SNH map is more than I expected though and very welcome. God help the rest of us. We need a change in energy policy, that's what we need Chris.